Provisional results from the third round of the SCX series are available here. If you have any queries, corrections, tickles or other feedback then please email scottishcyclocross@googlemail.com by Wednesday evening. We'll then update league tables ahead of SCX4 - Mugdock Country Park. Well done to all that raced, organised, officiated or served up frites and mayo! 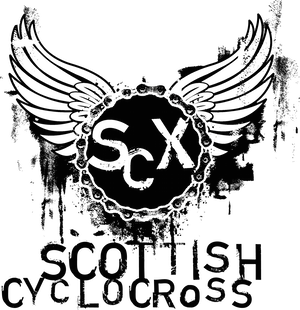 Loads of photos available in the Scottish Cyclocross Flickr Group. Feel free to add your photos to the group. Any results for U8's 10's and 12's? Not yet. Will post them when I get them. awesome work getting the provisional results and pictures up so quickly. bravo! the new timing system is a fantastic step forward, great to have lap times! thanks to ekrc, scx and all involved for putting on a great race on Sunday. Slight wrinkle with DNFs not being identified being sorted out now. Couple have slipped into league - will rectify. Looking at the right thing? Time in brackets is lap time, time above is clock time of rider passing through finishline. "...equality may come at a cost...." yeah tell me about it..it get's expensive burning good bras! I totally get that we are racing vet against vet, junior agaginst junior etc, however we are still all starting at the same time and regardless of whom you pit yourself against, some women are still disadvantaged starting at the back. Why not start them at the front?? Probably because it will hold the majority of men up and that wouldn't be good. Consider the women that can mix it with the men?... If you were a woman, wouldn't you be a little erked being put at the back and having to fight to get to the front?? Seeding according to your lap times would be more appropriate, both for women and those men at the back who's pride might be getting slightly hammered by being overtaken by some women each week.. Bra burning session over. Wouldn't seeding according to lap times add another layer of complexity to event organisation? Depending on circuit length and lap times to ensure no bottlenecks the various cats could all go off at say 1 minute intervals, vets, women then juniors. No problems with trying to get in front of grumpy old men like me then! Looking at lap times, the faster women are closer to the faster youths than fast vets. We might get better races with a women/juniors/youths combo. More evenly-sized fields. Less of a procession in the youths race. And up the youth time to 40mins + 1, if the rules allow it. I have noticed that all these catagories are also absent on the league tables. My I ask why this is? If a child does a lot of the events, will they not get fed up, not knowing their actual placings and league positions? I tried several times on the day to ask at sign on desk for finishing positions as I was on the start line for my race when prizes were distributed for young uns. No one was even able to tell me who won one of the younger catagories! Have to agree there..having a interval of a minute between races is probably a good thing. However in the end its all for a bit of fun, and if the women have to work a bit harder to get to the front its will just make us stronger in the long run.. Sorry, I was just being cheeky with that one. Whilst the 1 min idea sounds good, I wouldn't recommend it for cx. I'm involved in running SXC, and the start order and gap is the biggest headache we have, you can never please every, and more often changing the order following rider feedback just causes more complaints. I say keep it simple! the staggered start idea is one that is planned for the Sandy Wallace race to see how it goes. there is no under 12s series to allow children to enter and have fun on the day. It was agreed with SC that this was the best way to take the under 12s forward,the SC coaches may watch the races but aren't looking at results to see who should get onto programmes. I am sure the results will be published very soon from Sundays race. To change the duration of youth racing it would have to go to the SC board for approval. thanks for the comment re not putting a gap in the starting order, we will discuss it some more before we decide whether to try it.